Director of Housing and Outreach Programs with the Charlottesville Housing Foundation. Director of Christian Education at New Hope Baptist Church in Esmont. Long time Democrat. 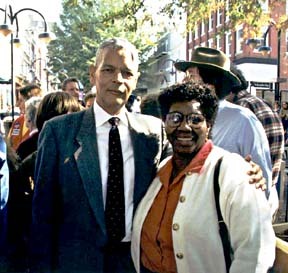 (Picture of Rosa Hudson and Julian Bond taken at Rally for Mark Warner, October 30, 1996). "I have been a Democrat ever since I registered to vote over thirty years ago and had to pay a head tax."